Hi Friends! Five more day…oh my, I am so ready. I took Friday off because my son graduated preschool. That was great, but I think that is making it harder for me to think that I still have five days to go. Oh well, I’ll ger there. In the meantime, I am linking up with the June Currently linky. 1. There is not much on, so I am living vicariously through House Hunters International. Wishing I could get a second home in the Bahamas. 2. It’s 9 p.m. here in CA and still light out. I love longer days. 3. Summer vacation…do I need to explain? 4. Watching House Hunter International is not helping me focus on the needing portion of May Currently. I love to travel, but it just hasn’t happened to the extent that it used to now that we have a kid…darn kid! (Just kidding, I love my kid to the moon and back). 5. Three more report card comments. I will finish that up tomorrow and then I will only need to pack my room for summer cleaning. 6. Vacation essentials- We are outside a lot, so sunscreen is a necessity. Summer is really the only time I get to read for pleasure. And lastly, summer naps…another point that does not need further explaining. There you have it! 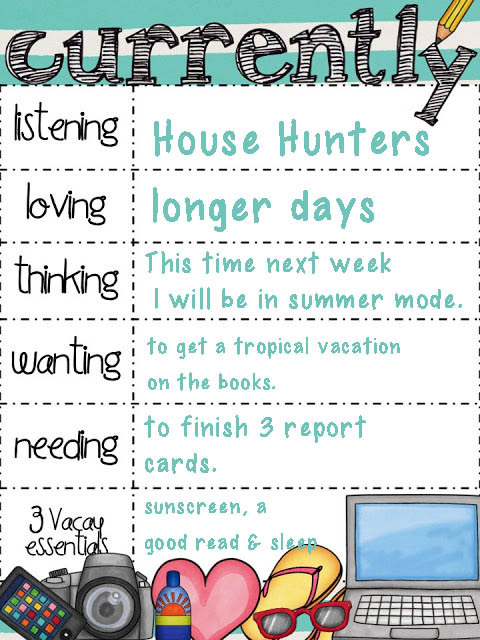 For those who are already on summer vacay, I hope you enjoying it. Have you read any good books? I’ll be joining the vacay club this Friday at 11:01 a.m. Your son graduated preschool and my youngest son will be graduating from high school on June 10th. They grow up fast! I have a long list of books I want to read this summer. Hopefully I'll get lots of time by the beach or lake to read. I always enjoy the longer hours in summer. We're in winter here at the moment though. A second home in the Bahamas hey? I'm always thinking a second home on a Greece island. 🙂 I should think they'd be rather similar in our minds. Relaxing, sun shining, beautiful crystal blue water, sandy beach, the quiet lane, simple but delicious food.